Sao Paulo - Hospitalized Brazilian football legend Pele is doing better and responding to antibiotics, but still receiving an intensive kidney treatment for a urinary infection, the hospital treating him said Friday. The 74-year-old star is "in improving clinical condition and continues receiving treatment in the intensive care unit," said the Albert Einstein Hospital in Sao Paulo, in its second update of the day. "He continues receiving kidney support treatment," it said. Pele has been undergoing hemodialysis, a procedure that involves filtering a patient's blood through an artificial kidney that cleans it before returning it to the body. "The only bacteria identified so far is responding to the antibiotics being used. No systematic infection has been identified," said the hospital, adding that he was "lucid" and breathing and eating on his own. Pele, whose real name is Edson Arantes do Nascimento, is widely regarded as the greatest player of all time. He was admitted to hospital Monday, diagnosed with a urinary infection and given intravenous antibiotics. On Thursday, the hospital said he had been placed in intensive care after his condition became "clinically unstable," causing widespread alarm. But Pele insisted on social media that he was fine and had simply been moved to another room for more privacy. "I want to take this opportunity to let you know that I am doing fine," he said in posts to his Facebook and Twitter accounts. "I am blessed to receive your love and support, and thank God this is nothing serious. "I was simply relocated to a special room within the hospital for privacy purposes only. While I appreciate all the visitors that came to see me, I really need to continue my treatment and recovery in peace." He said he would spend the upcoming holidays with family and looked forward to beginning 2015 "with renewed health," adding he had "many international trips already planned." His daughter Flavia Christina Kurtz Vieira, one of his six children, said Friday the worst threat to her father's health was nosy journalists. "He's doing great, he's responding well. He's in treatment, not in crisis or in serious condition," she told Brazilian news site UOL. "You guys (the media) are the ones killing him." Pele underwent surgery for kidney stones at the same hospital on November 13. He had to cancel an appearance at his museum in Santos, on the coast near Sao Paulo, on November 12 as he began showing symptoms of the illness. And he was also forced to miss a gathering of members of the Brazil team that won the 1970 World Cup in Mexico, who had come together to mark the 45th anniversary of his 1,000th career goal. But he appeared to be in good humor when he was released from hospital two days later, joking with journalists: "I am ready to play tomorrow." Nicknamed O Rei (The King), Pele was born in a humble home in the city of Tres Coracoes and exploded into Brazilian football as a young phenom with a singular talent for the national game. He made his professional debut for Brazilian side Santos at 15 and won his first World Cup aged just 17, scoring twice in the 1958 final win over hosts Sweden. He would go on to score a total of 77 goals in 91 games for his country across a remarkable career. In 1977, he inspired the New York Cosmos to the US national title in his final season with the club, which also featured fellow greats Franz Beckenbauer, Italian striker Giorgio Chinaglia and former Brazil captain Carlos Alberto. Beckenbauer wished his former teammate well Friday on Twitter. 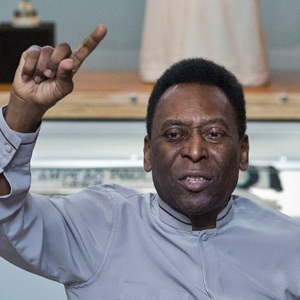 "I hope my friend @Pele is getting better soon. I pray for him!" he said. Pele, the only player to win three World Cup titles, was named the athlete of the century by the International Olympic Committee in 1999.